I love listening to podcasts, especially on my 40 minute drive to my shop (Sew Simple of Lynchburg) and while there are crafting and quilting podcasts out there, I don't typically listen to them. My usuals are business and productivity shows, something to hype myself up before work. But Leah Day has started up a quilting podcast, with a bit of quilting business focus and so I've been listening to it lately. I'm not a guest, but since Leah and I are doing our Tunic Challenge, I get a mention in Leah's intro section for the last 3 shows. My kids were around when I listened to one of the episodes, and they thought it was really neat to hear me being mentioned! This week's guest was Patsy Thompson, and you can check it out here: Hello My Quilting Friends, Episode #4 We all owe a big debt to Patsy as she recommended me to Craftsy to teach quilting with rulers. She also gave me some big pep talks as I was preparing to teach with Craftsy and do my thing. Want to hear more of Leah? Check out this listing of all Hello My Quilting Friends episodes. 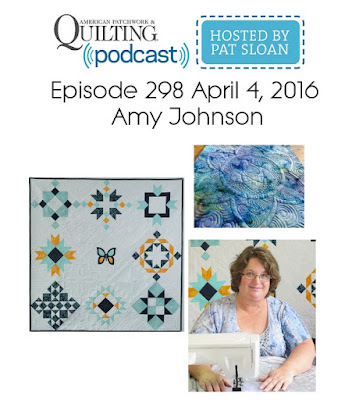 If you like to listen to podcsts, this is probably a good place to mention, especially as I have a lot of new blog readers over the last several months, that I was on Pat Sloan's American Patchwork and Quilting Radio Show in April. We chat all about ruler work and quilting with rulers on a sewing machine. She's a great interviewer and set me at ease. Pat's show is live, so you are really on the spot. I think there are some special measures that can be taken if you really foul up, but I am so glad we didn't have to go that route. How about you? Do you like listening to podcasts? In the car or while quilting? What are your favorites? Join me in wishing Leah much success with her new podcast! I have a 30 minute ride to and from work and podcasts make the drive more fun. I listen to a lot of Pat Sloan because I have a few years worth to catch up on. I will have to check out Leah's podcasts she has a way of making you feel so comfortable with your sewing and quilting progress. You do too! I love watching your tunics coming together. I have never made a muslin one first, I always just jump in and cut up my fabric hoping it will fit just perfect...hmmm...guess that is why I took up quilting. HERE IS MY LIST ... I will be updating it soon .. .. I wondered if you were the podcasting Nonnie. It’s been a while since I’ve listened, but yours was a favorite a few years ago. You’ve got a great sense of humor. I think you took a break and I never got back to listening. I’ll have to start again.